What happens to meaning when it is transformed from text to image, from concept to space or from human to parrot. The 4th symposium will draw on the previous symposium on the subject of emptiness and the nonself: “All phenomena in their own-being are empty (shunya)”. It implies that we and all existences do not have a solid core. How does this Buddhist concept relate to the way in which artists engage in ‘translating’ and ‘visualising’. Is the gesture of pouring meaning from one vessel to another in need of attentiveness to grasp the differences of presence of an image, language or space? Or is it a meaningless gesture in itself, a non existing mental construct? The reflection by Anastasija Pandilovska will be an attempt to look at the work of Wim de Haan, through the philosophical framework created by the symposia Emptiness and Infinite Space. That is to see how the Eastern philosophy weaves into the lines of his drawings and the ambiguous color-fields appearing on the paintings of Wim de Haan. His drawings especially his transition from drawing to painting can be perceived as soundless utterance of one’s chaos through which one can attain a state of stillness, that is emptiness. Tine Melzer challenges the performativity of language, the way language appears to us and how we perceive it. By focusing on perception, daily routines and memory, Tine’s language games initiate moments in which meanings shift. Tine Melzer will touch upon the position of language concerning giving and transforming meaning. A short reading from her new book BLEISULFID / LEAD SULPHIDE (Melzer&Kummer, 2018. Hobart: Lost Rocks) will set the framework for translation as a daily individual effort of matching knowledge with interpretation. Additionally, she will introduce prevailing issues of translation between image and text. How to transfer meaning from image to text and vice versa? How can aspects of translation themselves become visible? How does translation look like? Like a leaking vessel, like a ship or rather like a feather coat? For Emptiness and Infinite Space IV, Katja Mater brings together three of her films: Searching for White (2009, 16mm), Fields on a Line (2014, 16mm) and Threefold (2018, digitalised 16mm). 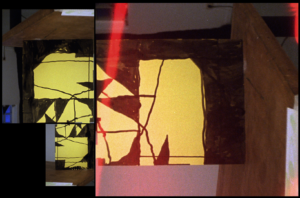 These short films are like gestures through which painting is being translated into moving image, lifted out of singular time while resonating with itself. She opens channels to something beyond our senses, parallel worlds of multiple time frames and dimensions. By bringing time into the two-dimensional world of photography she constructs layers of moments. Within Threefold, Mater explores the making of a drawing in an approximate golden spiral using a 30 seconds interval. The film creates a new present moment by resonating between its own past, present and future, providing a surreal time experience. The soundtrack of this film is performed live by Colin Wolf, Katja Mater, and Byrthe Lemmens. The echoing sound of the singing crystal bowls generates an interference pattern of interacting sound waves, possibly causing an automatic state of meditation. Tim Ayres explores the potentiality of text to be the central theme and image of the painting. Canvases covered with bold colours and precise lettering presenting short statements or simple words are creating a well constructed image. Recently, the construction of the images has changed. Using his personal handwriting now, Ayres’s paintings suddenly introduce fluidity. It is the kind of fluidity that arises from the performative moment in which meaning is materialised. Tim Ayres abolished the stencil he used as a painting tool, it resulted in a fresh emphasis on the ‘what and the ‘how’; every change influences how the other is experienced. 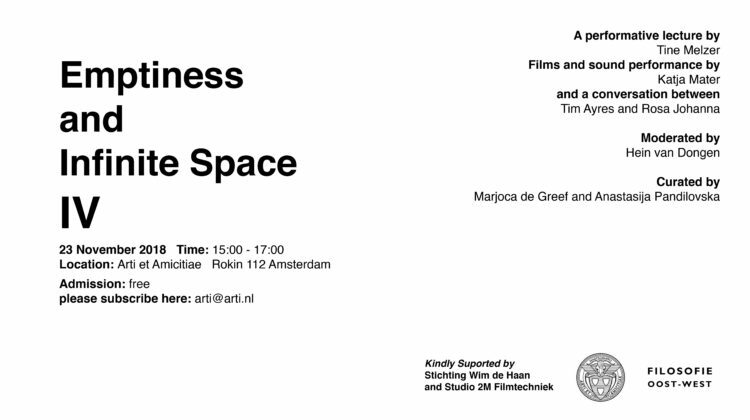 During the symposium, Tim Ayres will be interviewed by Rosa Johanna regarding his decision to remove the stencil from the canvas.